Made from High Quality ABS composite material. 2 Colour construction, Green with White Accents. Each chip has a Shiny Gold Foil printed number '25' on BOTH sides. These High Quality Suited Numbered 12g Poker Chips are a classic 2 colour construction made from high grade ABS composite material. 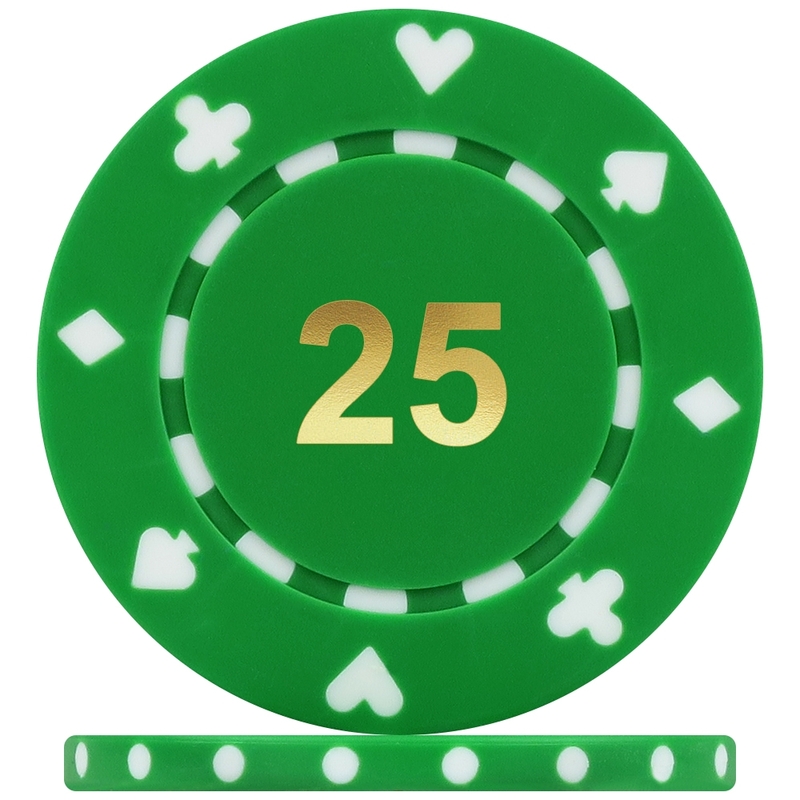 Each Green chip comes with a Shiny Gold Foil printed number '25' on both sides and features a pair of White Hearts, Clubs, Diamonds and Spade suited design and edge spots. The poker chips have rounded edges to aid smooth play, they lay flat so they don't rock, stack well and have a pleasing clunk when rifling. Available in single rolls of 25 poker chips and in various cased poker chip capacity. Cased sets include High Quality Suited Numbered Poker Chips, 2 packs of 100% plastic playing cards, 5 red dice, dealer button, big blind button, small blind button and 2 cut cards. Please Note: Colour shade may vary depending on your viewing screen.